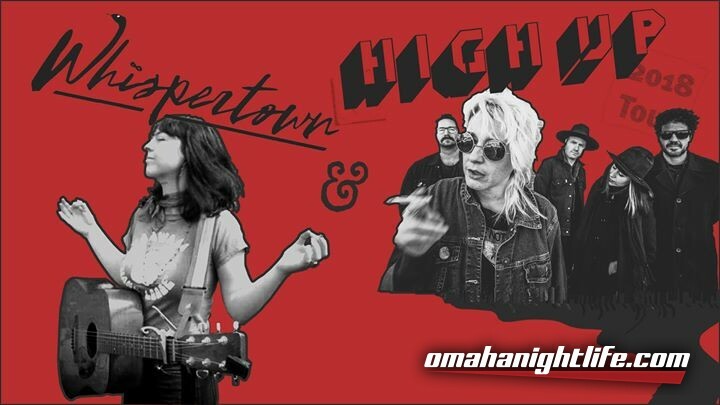 High Up singer Christine Fink moved to Omaha to be closer to her sister, notable singer songwriter Orenda Fink (Azure Ray, etc.) back in 2012. Down South in Muscle Shoals, Alabama, Christine had been known to exercise her theatrical roots at the the local karaoke bars - and to great effect. The first time Orenda saw Christine sing at Sheffield's Old Town Tavern her jaw dropped as she watched her sister bring the house down. After a few years in Omaha, Orenda noticed that Christine brought the house down no matter where she was singing- with people of all ages and walks of life lining up to buy her drinks and even give her requests to sing their favorite soul songs. But Christine was depressed, feeling aimless, shuffling between minimum wage jobs, and the thrill of the weekend performances wore off quickly. One night, the two began to talk about the future, and Orenda insisted that Christine should try and do what makes her happiest- perform for people. After much discussion, they decided to start High Up, a collaboration mixing elements of indie, punk and soul that showcased Christine's powerful vocals and Orenda's seasoned songwriting. The band, which includes Josh Soto, Todd Fink (The Faint) and Matt Focht (Head of Femur, Bright Eyes) draws from a wide variety of influences- from Janis Joplin, (who Christine is frequently compared to at live shows by misty-eyed ex-hippies), Sam Cooke, and Screaming Jay Hawkins to Dead Kennedys and The Birthday Party. Their debut record, "You Are Here" was produced by Mike Mogis (Bright Eyes, First Aid Kit, Monsters of Folk) at ARC Studios in Omaha, Nebraska. LA-based Whispertown is the latest iteration of the unique vision of Morgan Meyn Nagler (songwriter, lead vocals, guitar). What was once The Whispertown 2000 has morphed into a less structured version of itself, with Nagler's unmistakable vocals leading a revolving cast of musicians and artists. I'M A MAN (produced by Jake Bellows) out now on Graveface Records, marks Nagler's return, and 3rd full length release. After being diagnosed with a polyp on her vocal cord, and faced with the possibility of never singing again, Nagler discovered she is without a doubt a "lifer", and married to song writing, for better and for worse. I'M A MAN is a stripped back acoustic album, set in a naturally psychedelic world, where words reveal themselves in modern mantra - "New Genes in Blue Jeans".